Fantasy in itself pertains to man-made creations inspired by the incredible realities of the existing world. These ‘realities’ go beyond the conventional scope, to wondrously account for something extraordinary, fabulous and even bizarre. 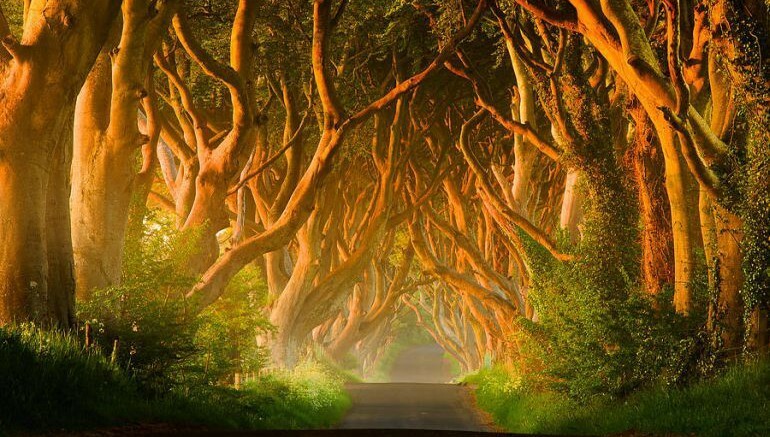 In essence, fantasy can be found in our very own real world; and these listed ten amazing real places to visit stand testament to the surreal, spectacular and mysterious beauty of nature. 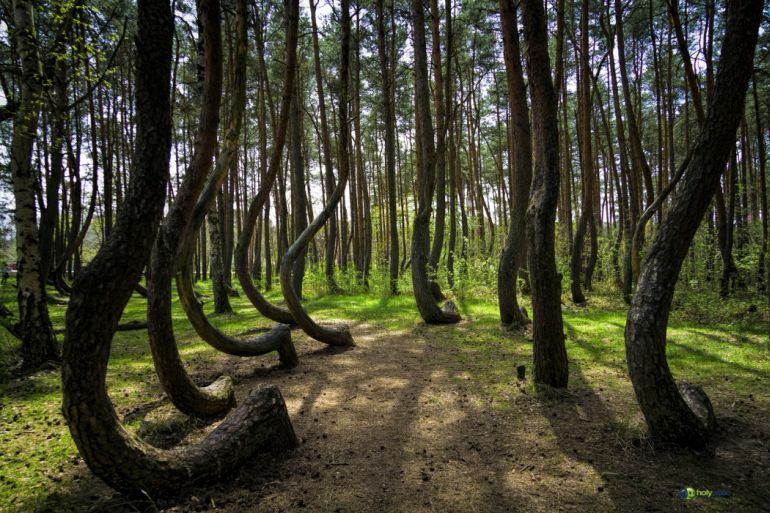 Near the town of Gryfino, in western Poland lies the absurd, nigh dream-like woodland that is unsurprisingly touted as the ‘Crooked Forest‘ (or Krzywy Las in Polish). 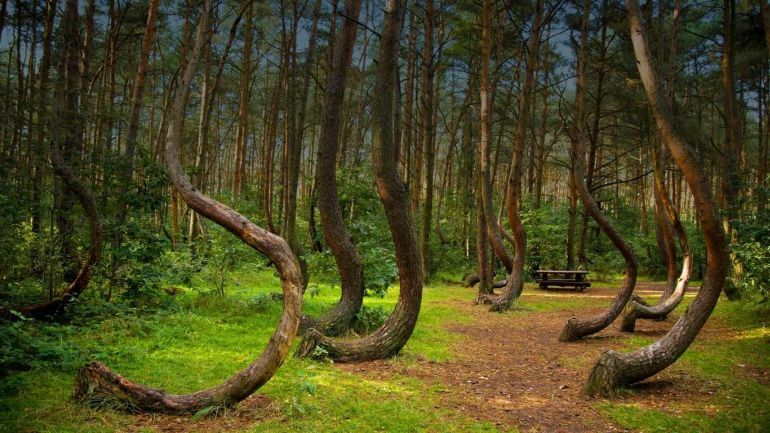 This odd area in itself just boasts of around 400 pine trees with their bizarrely bending bases. And intriguingly enough, this closeted patch of bending trees is surrounded by a larger forest with conventional straight pine trees. 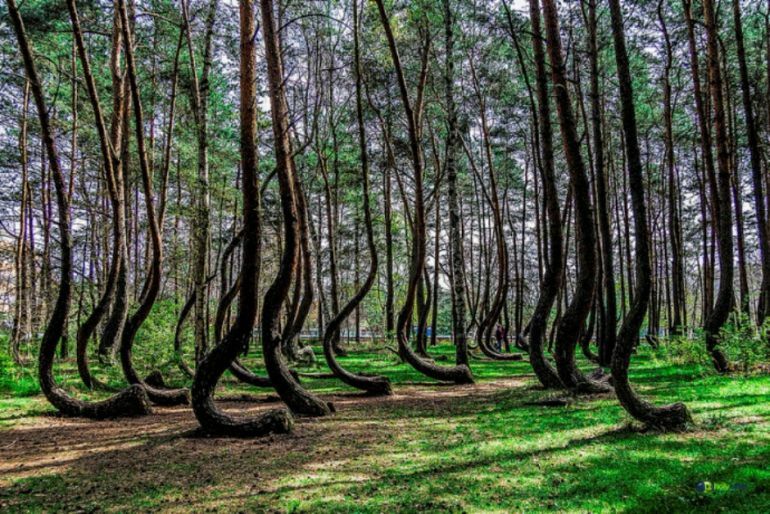 So naturally, the Crooked Forest has pinched the curiosity of many an expert, and they formulated a few hypotheses as to why the trees (originally planted in 1930s) are unnaturally bent. These theories range from plausible ones like – the tension created by heavy snow affecting the original saplings (and then spring season taking the pressure away by melting the snow); tantalizing ones like – some effect of a unique gravitational field in the area; to boring ones like – they might have been man-made for crafting furniture or boats. In any case, scientists are still not sure of the actual reason that might have caused the collective morphing of just these 400 trees in the entire forest. 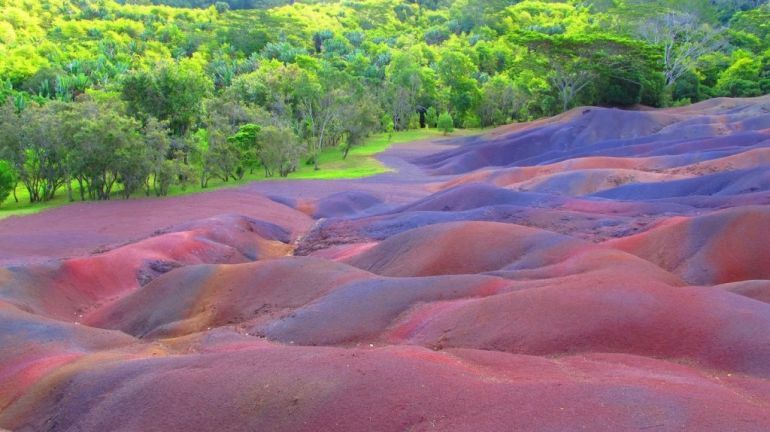 Surely one of the best places to visit while on a vacation, the Seven Colored Earths is a unique patch of land consisting of kaleidoscopic sand dunes, and that too in the tropical environment of Mauritius. 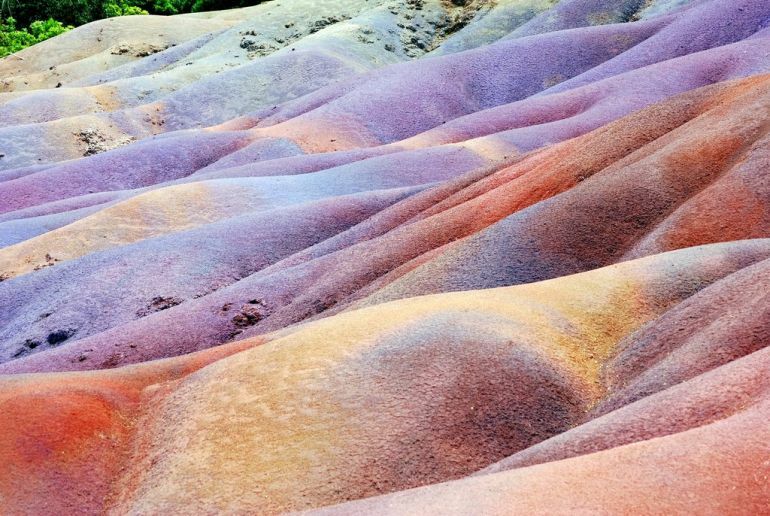 So, as one can make out from the images, the dunes are vibrantly patterned with the sand colors ranging from red, brown, violet, green to blue, purple and yellow. And the really odd part is – even you took a small sample of the sands from the area and mixed them together, they would still align themselves in accordance with their separately layered spectrum. 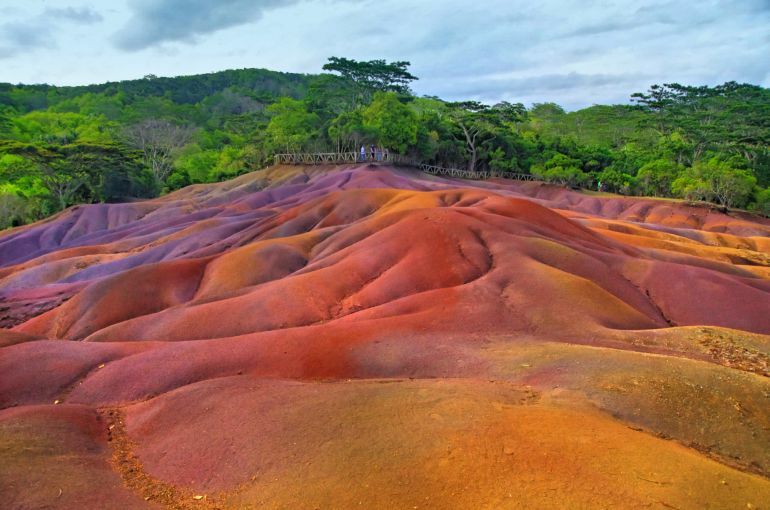 Now, as to what causes this striking phenomenon, the variant hues of the Seven Colored Earths were ironically brought on by the tropical conditions of the zone. To that end, the weather had managed to wash out majority of the water-soluble compounds like silicon dioxide, thus leaving behind reddish-black iron oxides and aluminium oxides. These compounds are the ones to endow the different tints in the sands, which further results in vivacious shades of blue, cyan and purple. As for the sands themselves, they are probably a byproduct of volcanic rock decomposing into clay. 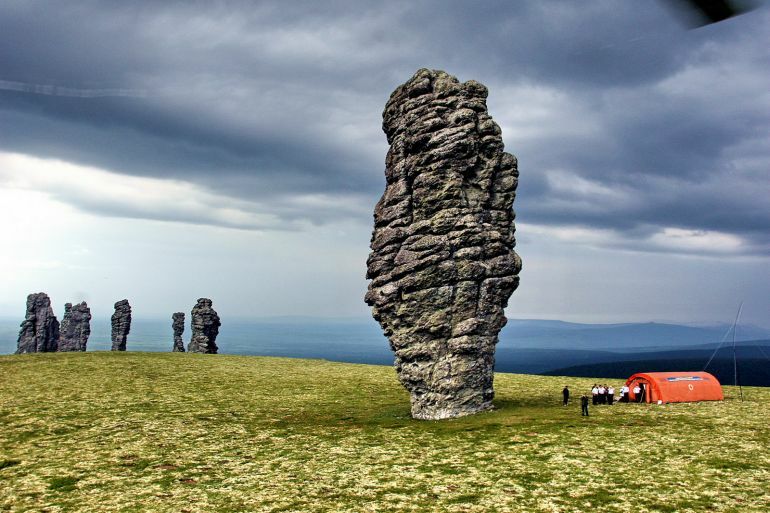 For our next amazing place to visit, we go towards the Manpupuner Rock Formations of Siberia. 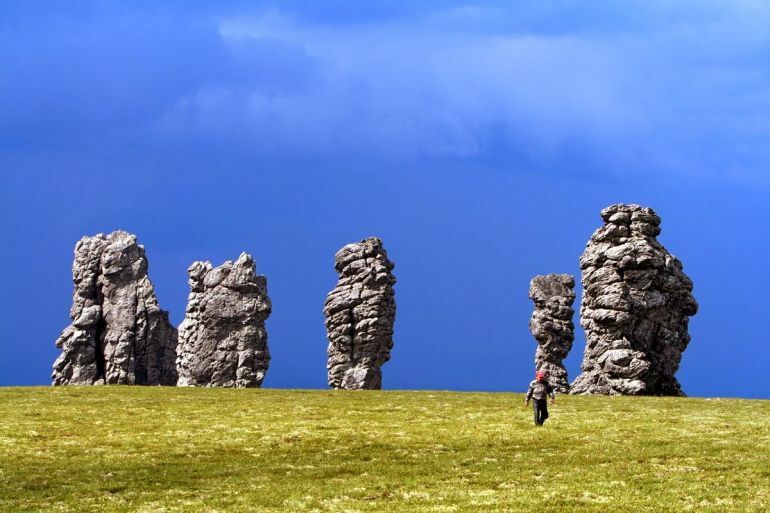 Situated west of Russia’s Ural Mountains, in the Troitsko-Pechorsky District of the Komi Republic (pretty close to the Arctic circle), these impressively rugged specimens (also known as Seven Strong Men) entail a group of seven rock formations that reach staggering heights of 30 m (99 ft) to 42 m (138 ft). Interestingly, these formations jut out almost obstinately from a ‘sea of grass’ above a high plateau region, thus making their mighty case for a contrasting landscape. 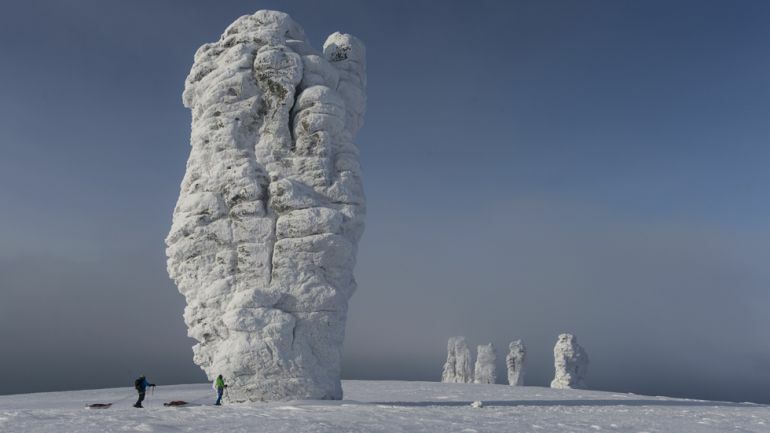 As for their geological attributes, the Manpupuner Rock Formations probably pertain to karst topography – formed due to dissolution of soluble rocks like limestone and dolomite, brought on by the effects of ice and winds. However, their myth goes beyond the scientific scope, with locals believing them to be group of Samoyeds giants who were walking by the hilly landscape. In any case, the ‘Strong Men’ can also be climbed – if you are opting for an adventurous trek. 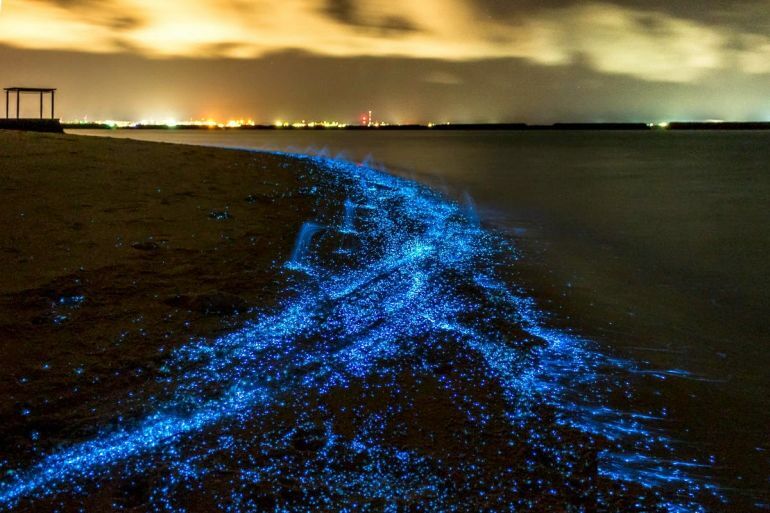 With an impressive sounding name like ‘Sea of Stars’, the glowing speckles of light encountered in the beaches of Vaadhoo Island, Raa Atoll, Maldives do not fail to astonish many a traveler. This surreal fantasy-esque experience is actually fueled by a biological phenomenon known as bioluminescence. In that regard, the waters around the beach are inhabited by colonies of marine microbes (or phytoplankton) known as dinoflagellates. These dinoflagellates float in the marine-environment, and the resultant motional attributes generate electric impulses in close proximity (on cellular level) to a proton-filled compartment inside the organism. This in turn leads to the activation of voltage-sensitive proton ion channels, thus creating a series of bio-chemical reactions. 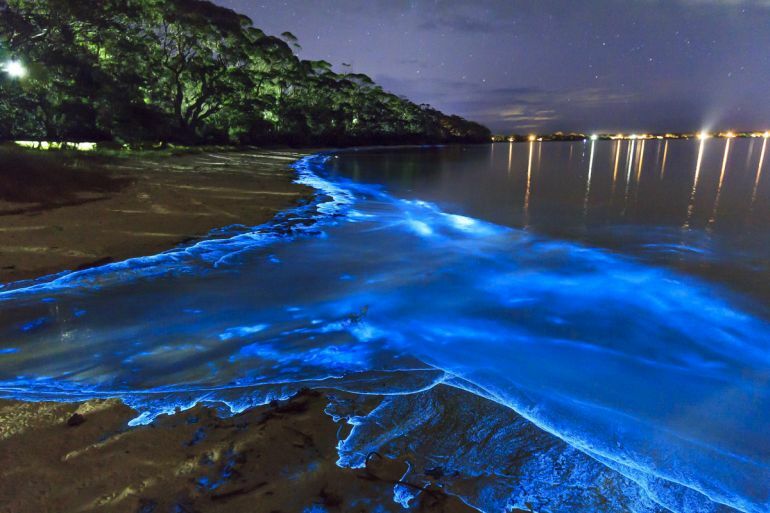 These reactions ultimately trigger a protein known as luciferase that emanates the serenely bluish-glow along the water bordering the beach. 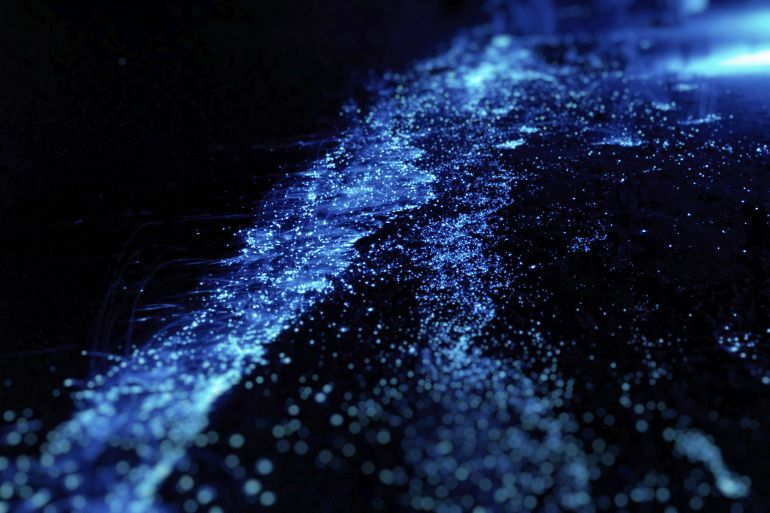 Now, in case the explorer inside you is interested, such cases of fascinating bioluminescence on beach waters are not only exclusive to Vaadhoo Island. The other amazing places to visit include – the coast of Leucadia, California; the shores of Lakshadweep Islands (India); and famous Mosquito Bay in Vieques, Puerto Rico. 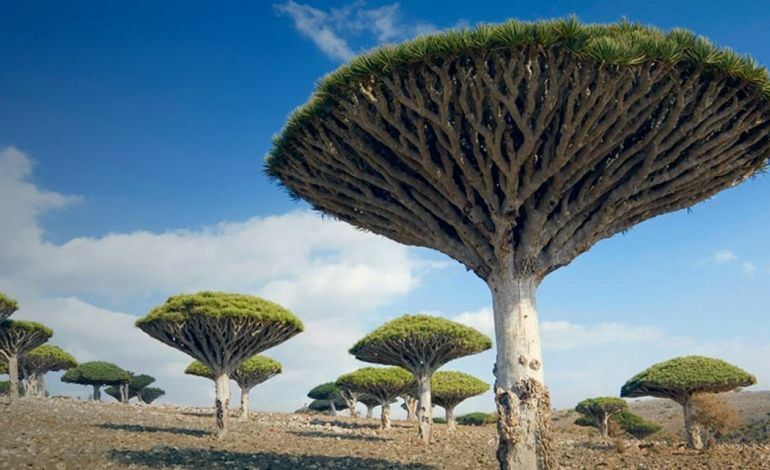 While most of the earlier entries have some sense of the ‘earthiness’ to them, Socotra of Yemen almost flaunts its alien-esque scope. 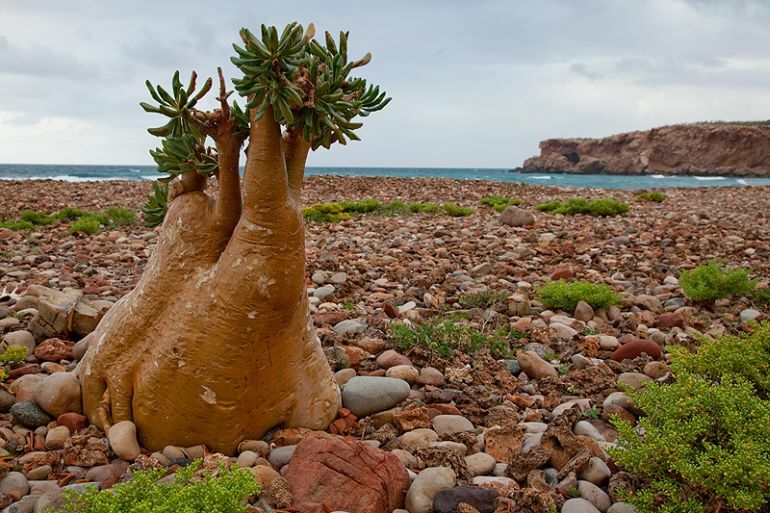 Hot and arid, the archipelago of four islands had been geologically (and geographically) isolated from its original African continent for the last 6 million years (by a distance of 150 miles from the Horn of Africa). Suffice it to say, the islands boasts of a myriad rare species of both flora and fauna, with the number estimated to cross the 700 mark. And among these varied 700 specimens, at least one-third are endemic to the island, i.e., not found anywhere else in the world! 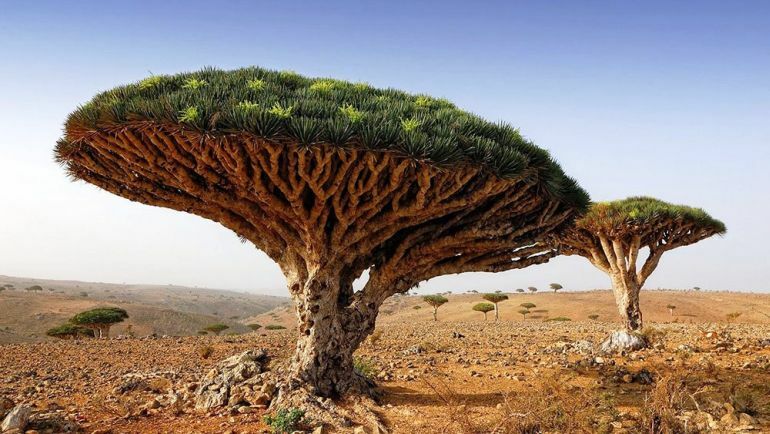 One of the confounding looking endemic plants of the Socotra pertain to the umbrella-shaped dragon’s blood tree or Dracaena cinnabari (pictured above), with its exotic name keeping up with its legend that the red sap was supposedly the dragon’s blood of the ancients. However in realistic terms, the sap was used as a valuable resin for dyes and varnishes. As for other endemic examples of nature, the archipelago further showcases startling specimens like the giant succulent tree Dorstenia gigas.